Catalina Island: 15 minutes! Big Bear: less than an hour! San Diego: less than an hour! Santa Barbara: less than an hour! The Private Pilot Certificate allows you to fly day or night, in VFR (Visual Flight Rules – flight by outside visual references). You must be a citizen of the U.S. (or obtain TSA approval before training – PSA will assist in qualifying), pass a basic medical exam, and be at least 17 years old to obtain your license – but you may begin training at any age! It also allows you to carry passengers with a limitless range of where you want to go. And finally, you must understand the term “FUN.” We will not tolerate students who do not meet this last qualification! The Instrument Pilot Rating opens the door to the world of IMC – Instrument Meteorological Conditions – or ‘flying in the clouds’. The Instrument Rating will hone your flying skills to a new level while teaching you advanced navigation techniques that allow you to fly anywhere in the country in many types of weather conditions. 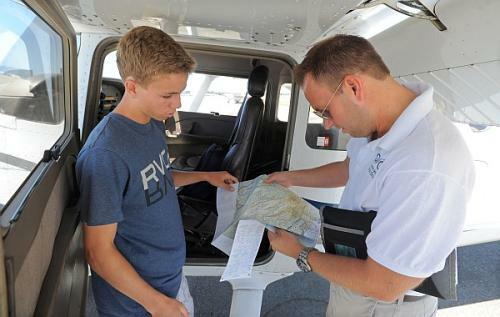 Refresher or transition training in your personal aircraft! Contact us for more information at info@pacificskies.com or call us at 888-579-6999.